Put your Community in the Hands of your Members! 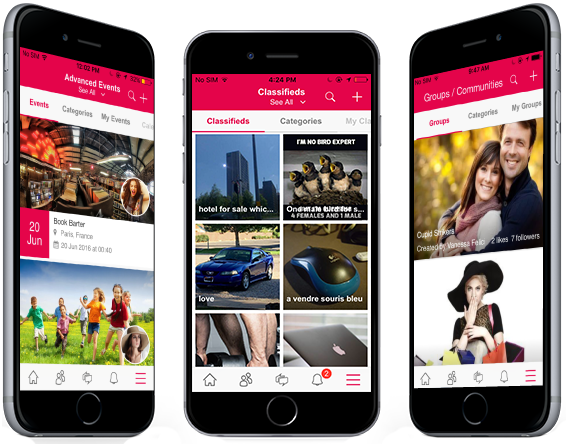 Having your own Mobile App is very crucial to increase engagement on your Social Network, and for the success of your online community. 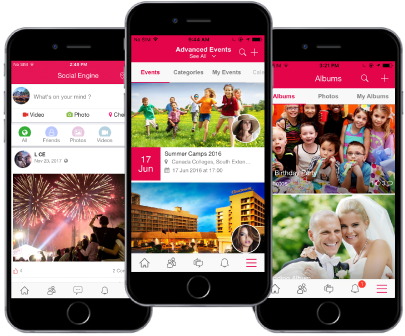 Our iOS App product enables you to get a iPhone and iPad App for your website, thus allowing many of your users to stay connected on-the-go with your community. 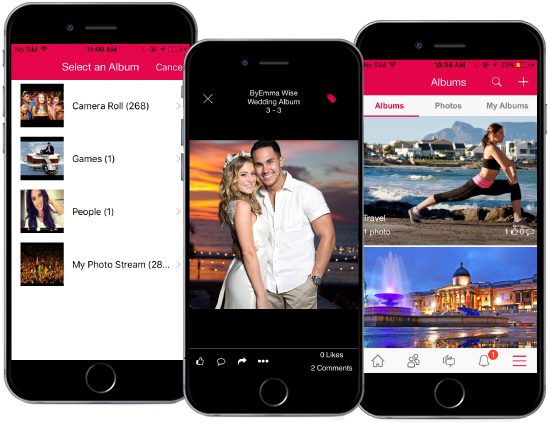 With many interactive features, beautiful interface, easy content browsing & searching, quick content creation, messaging, status updates, photo sharing, activity feeds, and lots more, this product provides optimal features to keep users engaged to your app on mobile. Put your Community in the Hands of your Members. Great app experiences over multiple devices, be it iPhones or iPads. 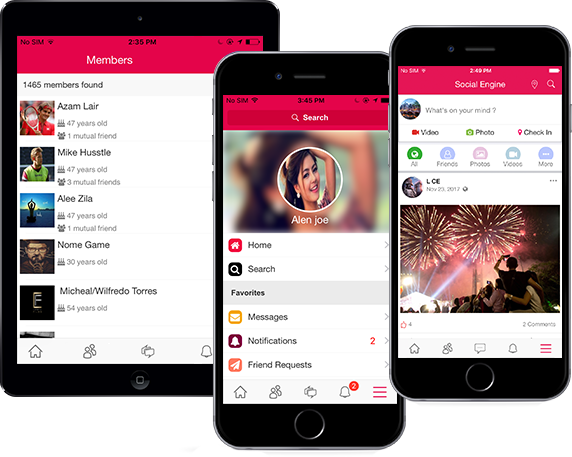 Having your own Mobile App is very crucial to increase engagement on your Social Network, and for the success of your online community. 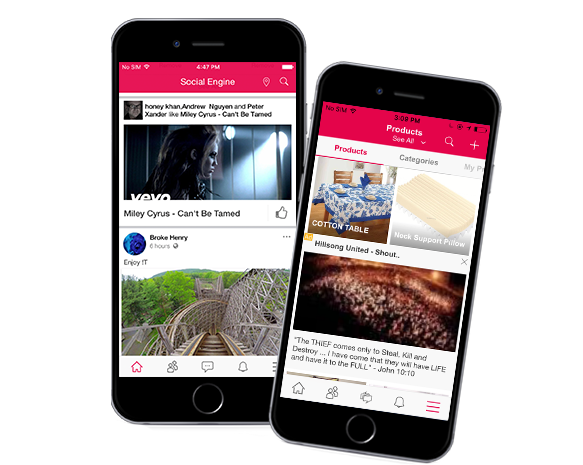 Our iOS App for SocialEngine product enables you to get a Native iOS Mobile App for your website, thus allowing many of your users to stay connected on-the-go with your community. This App works well on both iPhones and iPads. One App that works well on iPhones as well as on iPads. Sound effects on Like Buttons, Pull to Refresh action and while Posting Comments. User Subscriptions: Leverage paid subscriptions with in-app purchase feature. 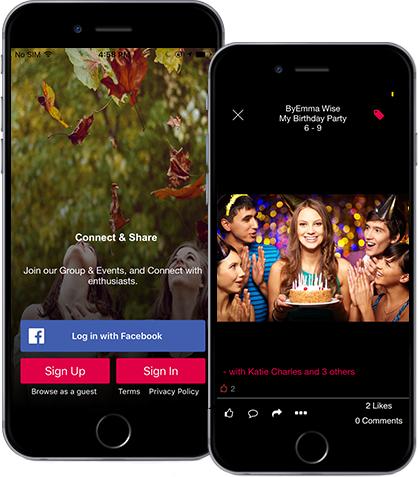 Spread the Word feature in you app for sharing app's link to various social networks, thus increasing user engagement. Monetization with Ads: Implementation of Google Admob and Facebook Ads enables monetization in your iOS App. Get free to implement tips from here: https://www.socialengineaddons.com/content/monetize-ios-android-mobile-apps-google-admob-facebook-ads . 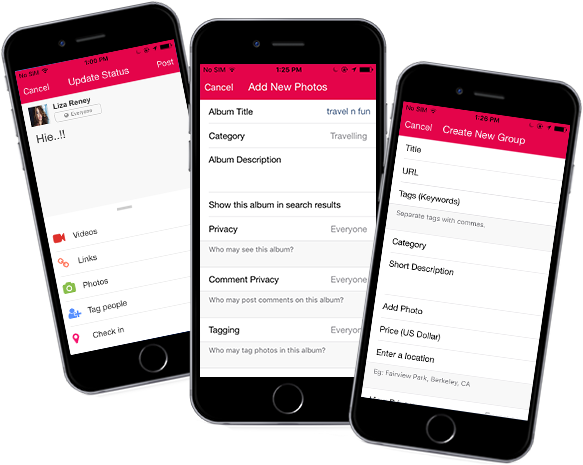 Admin can configure menus in the dashboard from the admin panel of the plugin for iOS App. Any changes made by admin in the dashboard will be available to all app installs on mobiles, without requiring app upgrade. 4. From the "API Consumers" section in the Admin Panel of "REST API Plugin", create a new API consumer for your website's iOS App. 5. 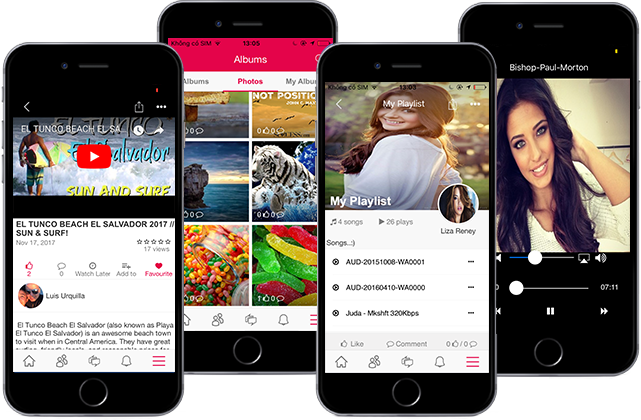 Install the plugin: "iOS Mobile Application" that will be available in the "Files" section of your SocialEngineAddOns Client Area after your purchase of a Mobile Apps Subscription Plan. 6. In the Admin Panel of "iOS Mobile Application" plugin, configure "Global Settings" and "App Dashboard Menus". Then go to the "iOS App Setup" section and fill the details for app build-up. If you have purchased our Mobile Pro plan, then also fill the details of your app store developer account. Then email those details to us as per the instructions provided on that page. 7. File a Support Ticket from the "Support" section of your SocialEngineAddOns Client Area with the subject: "iOS App Build and Setup" and notify us to proceed with app building. If you have any questions regarding the details required for app building, then please ask those via this same support ticket. We will be submitting your iOS App to the Apple iTunes App Store within 24 to 72 hours of receiving all the details and support ticket from you, and will be providing the ".ipa" app installer file to you if you have ordered our Mobile Pro Plan. 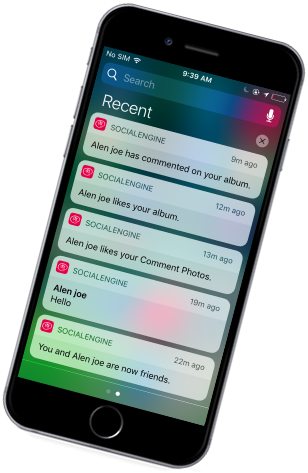 SocialEngine Core Modules / Functionalities: Login, Signup, Member actions (add friend, accept friend request, remove friend, etc. ), Members, Profiles, Notifications, Messages, Requests, Likes & Comments, Share, Activity Feeds and Subscriptions etc. 3rd-party plugins or SocialEngineAddOns plugins that are not natively integrated with the app can also be very well made available in the app via WebView feature. Hence, all the main features of your website can be made available in your iOS App. This is easily configurable from the admin panel. For details, please read this article. How long does it take for an app to get published on the Apple App Store after submission? iOS apps are normally reviewed and approved in 2 - 3 Days. But in some cases, app approval may take longer. The iOS App source code is not available with the purchase of this basic product. 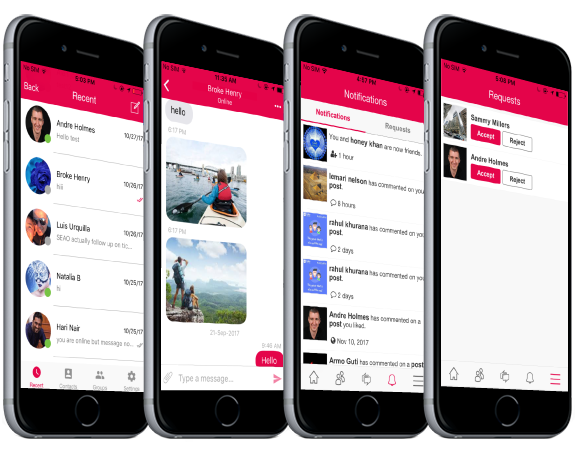 If you are interested in obtaining the source code for iOS App and its source code license, then please click here to contact us for more information about our Enterprise plan.